It is one thing to talk about the need for nuclear power in the United States — it is another thing altogether to understand the strategies required to ensure that nuclear maintains its current status quo. The nuclear industry faces serious challenges which must be overcome if it is to maintain its current share of the market. According to the nuclear industry, to maintain its current share of electrical generation in the United States, 50 new 1,000 MW reactors need to be built by 2030. [i] This goal is highly unlikely to be reached, and the much acclaimed “Nuclear Renaissance” has peaked and is already on the decline. The biggest problems facing the nuclear industry hasn’t been opposition from anti-nuclear or environmental groups, an unrefined regulatory process, or a lack of financial relief, as much as it has been the inability to produce critical components on-time from manufacturers. The construction of future reactor sites must be able to prevail over delays and cost overruns which are tormenting current projects. These problems didn’t appear overnight, they were the result of a series of conscious legislative and business actions stretching back over thirty years. 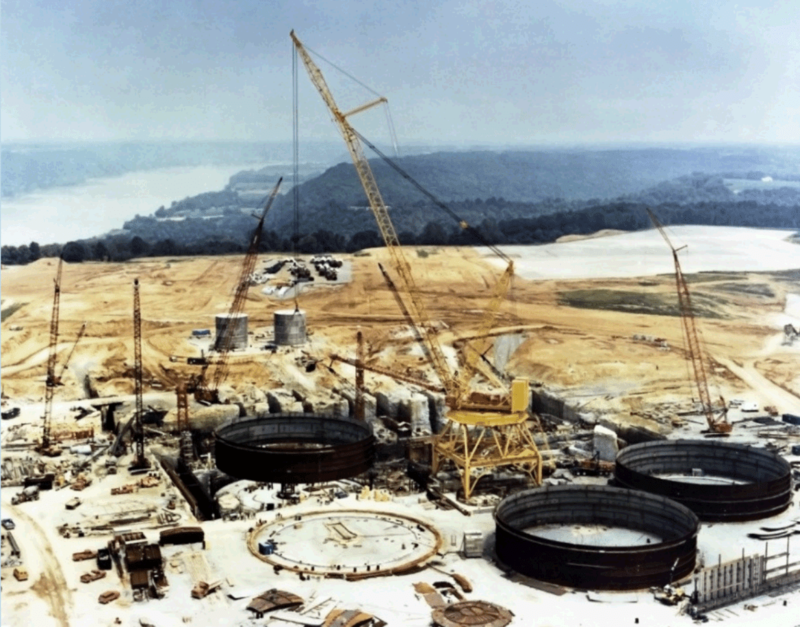 Most of the nuclear power plants operating in the United States today were constructed and licensed during the 1960s and 1970s and were only designed to operate for 40 years. To date, the owners of the 99 operating nuclear reactors in the United States have opted to avoid constructing new nuclear facilities, preferring instead to pursue license renewal and power uprates of existing nuclear reactors. Before the streamlined process, applicants interested in constructing new nuclear power plants had to go through a two-step licensing process, known as the Part 50 process. [iii] Applicants would first apply for the construction permit, only after construction was completed were licensees allowed to apply for an operation license. Since the costs of construction were so undeniably high, and there was no guarantee that an operating license would be granted, no new nuclear power plants were constructed for three decades. There was a lack of standardization among nuclear power facilities. Each constructed reactor was unique from the others, even those with the same basic reactor design. The Part 52 process was introduced by the Nuclear Regulatory Commission in order to combat these issues. [iv] The streamlined process combined the application process and allowed applicants to select from pre-certified reactor designs. The Part 52 process has proved more predictable in licensing than the Part 50 process. Now, applicants are not only assured that they will have an operating license from the NRC when they receive the construction permit, they also can pick from reactor designs like the Westinghouse AP1000 that have already been certified by the NRC to quicken the licensing process. The Part 52 Process also allows Early Site Permits, which allow the applicant to get a reactor site approved without having determined what reactor design will be constructed. Amidst all of these changes, the new licensing process also minimizes the public opportunity to intervene before the plant becomes operational. The threshold for intervention is much higher after the Combined License (COL) has been issued. A hearing can only be granted with prima facie evidence that one or more Inspections, Tests, Analyses, Acceptance Criteria (ITAAC) has not been met. If the licensee is able to demonstrate that the ITAAC are met, then there are no grounds for hearings and no possible intervention for the public after the COL has been issued. The new licensing process meant that the nuclear industry could no longer easily blame regulators and a two-step licensing process for holding up construction schedules and bringing new plants online. The Part 52 process has not solved all or even most of the issues — instead it has only further revealed the complex nature of problems surrounding the construction of nuclear power plants. The combined application process didn’t lead to the expansion of nuclear projects as anticipated. It would take more than fifteen years for an applicant to use the Part 52 process for licensing a new nuclear power facility. The financial challenge facing utilities interested in building nuclear power plants is impossible to overcome without special treatment from state regulators, federal loan guarantees, or tax-related stimulus for investment. The companies which look to build a new nuclear facilities are relatively small when compared to the large capital investment required, and simply do not have the power to finance a project of such scale on their own. Further complicating the issue, Wall Street has repeatedly refused to fund nuclear power plant construction projects because of the costs and risks involved, seeing other methods of power generation as more cost effective and prudent. 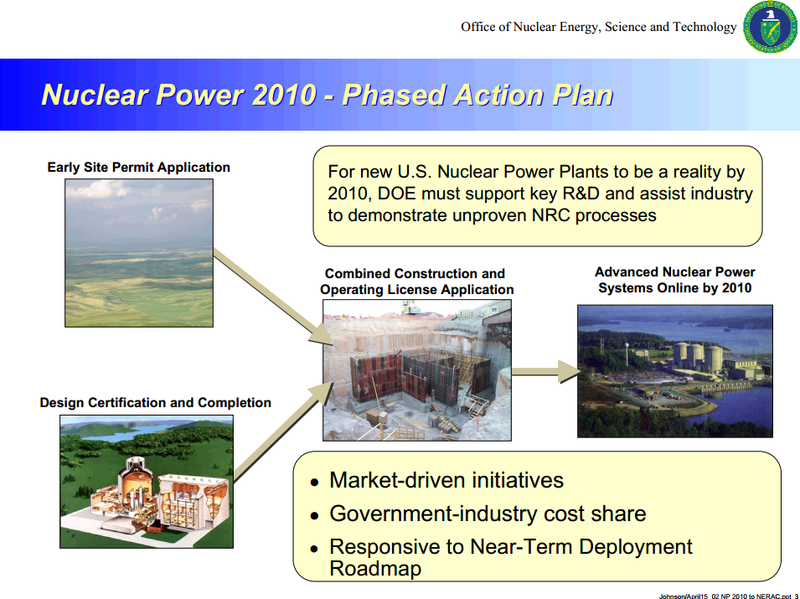 The Nuclear Power 2010 Program was established as a government and industry cost-shared effort in 2002 to support the construction of new nuclear power facilities, expand the generating capacity of nuclear power in the U.S. energy portfolio, and demonstrate the new Part 52 licensing process. [v] The goal was to put new nuclear power plants into operation by 2010. It was understood that in order to make the goals of the action plan a reality, a concerted effort would have to be put forward by multiple agencies and the nuclear industry. The NRC needed to aid in the applications for Early Site Permits and Design Certification, the DOE needed to support research and development, and the industry had to work with the DOE to demonstrate unproven processes. Seeking to aid the construction and development of next-generation nuclear reactors, the United States Government next passed the 2005 Energy Policy Act which met all of the pre-requisites laid out by the nuclear industry. The Act offered licensees different incentives, one for innovative technologies in the form of Production Tax Credits (PTCs), and a collection of federal loan guarantees that could cover up to 80% of the construction costs. [vi] The federal loan guarantees ensured that in the case of a default by the licensee the US Government would reimburse the lender the principle and the interest. The Energy Policy Act also provided that federal insurance would cover the costs stemming from delays from licensing or litigation procedures. Federal loan guarantees are not the main reason that both the V.C. Summer and Vogtle construction projects are proceeding. While the Energy Policy Act of 2005 did increase the financial profitability of a project after it is constructed and put into operation, it did not improve the financial challenges being faced by applicants before and during the construction progress. CWIP is a relatively new legislative policy in terms of building utility power generation properties. Historically, the construction of utility generation assets would be financed by lenders and investors and customers would only begin paying after the power plant was producing electricity and consumers were receiving a service. In 2009 the “Georgia Nuclear Energy Financing Act” was passed which made it legal for utilities in Georgia to charge ratepayers up front for nuclear reactor construction projects. South Carolina passed the “Base Load Review Act” in 2007 that allows utilities to collect costs from rate payers through annual rate increases. CWIP not only gives companies incentive to make a commitment to build next-generation reactors, but also eases the strain on the companies’ cash flow by opening up the wallets of the ratepayers with no guarantee that the project will be completed or ever be put into service. In a nutshell, CWIP laws allow utilities to charge ratepayers for plants whose original predicted construction costs are not accurate, whose total project costs are not publicized, whose completion dates are unpredictable, and whose ability to complete the construction project and ultimately produce commercial power is not guaranteed. When South Carolina passed the “Base Load Review Act” in 2007, they created a regulatory mechanism that specifically encourages nuclear construction. The legislation also gave utilities in South Carolina automatic annual rate hikes without full rate proceedings. To demonstrate that CWIP and not only federal loan guarantees are attracting new reactor construction projects, one only has to look at the proposed Levy project by Duke Energy in Florida, Duke Energy’s work to enhance CWIP legislation in North Carolina, or the previously proposed Calloway 2 project in Missouri. In Florida, Duke Energy dropped its plans to build the $24.7 billion Levy County nuclear power plant citing “regulatory uncertainty” after the state changed its laws and endangered whether the utility would be able to collect additional funds from ratepayers for construction work before the project had been finished. In 1976, Missouri voters passed a law that prevented utilities from charging customers for construction costs until the plant was brought online and producing power. Ameren Missouri, the operator of the single unit Calloway nuclear reactor, submitted an application for a Combined Construction and Operating License to the Nuclear Regulatory Commission proposing a next-generation second unit at the Calloway nuclear power plant in 2008. Ameren tried to change the 1976 law by developing a bill called the “Clean and Renewable Energy Construction Act” which would allow charging ratepayers for CWIP, by contributing over $125,000 to political campaigns, and also by paying for a television advertising spot aimed at increasing support for their bill. Utilities in North Carolina have a more conservative version of CWIP then their neighbors in South Carolina, which does not guarantee that the utility would be able to subject ratepayers to annual rate increases while the project is still under construction. In 1982, North Carolina pass a ban on CWIP financing, which was reversed after pressure from Duke Energy and Progress Energy when the State passed the Renewable Energy and Energy Efficiency Portfolio Standard in 2007, but it still would not be as easy for utilities to pre-charge ratepayers as it was for utilities in South Carolina because all costs would have to be approved in an official rate review. The State of North Carolina continues to be pushed by Duke Energy and Progress Energy to pass a more enhanced form of the CWIP legislation that would essentially guarantee annual rate increases. Duke Energy CEO Jim Rogers has insisted that they will not build any new nuclear power plants in North Carolina until the state updates the cost recovery mechanism to match South Carolina’s “Super-CWIP” legislation. It can be argued that by simplifying the licensing process, regulators helped create a more complicated and less regulated vendor supply chain, which is one of the primary issues holding up the construction of nuclear power plants in the United States. 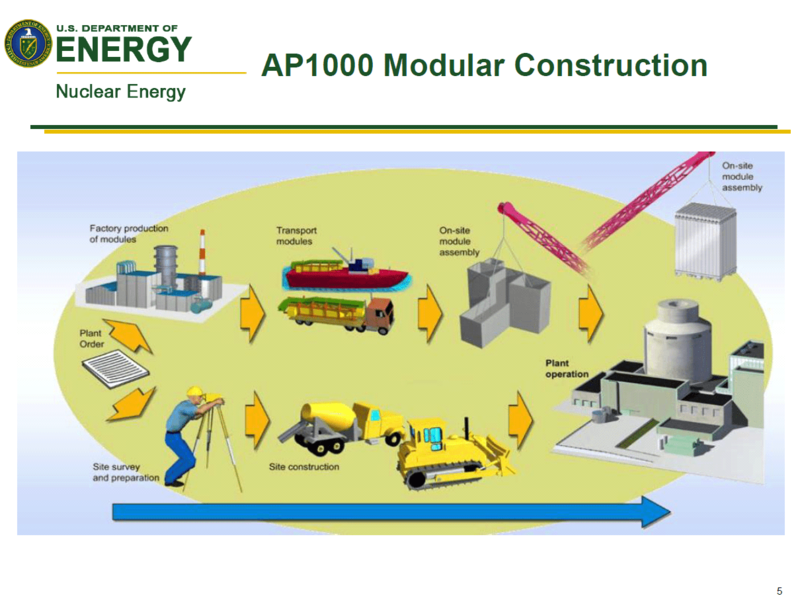 One of the major selling points used by utilities in the United States when pitching the new reactors was a new and improved streamlined modular construction process. The idea was that if licensees elected to use pre-certified designs, the manufacturers (who are hired by reactor designers to produce critical components) could also streamline the production process by breaking the design down into modules and sub-modules which could be fabricated at a central facility and delivered to the plant construction site for final assembly. In 2012, the first new reactor projects in decades — the V.C. Summer nuclear power plant and the Vogtle nuclear power plant, were both approved. 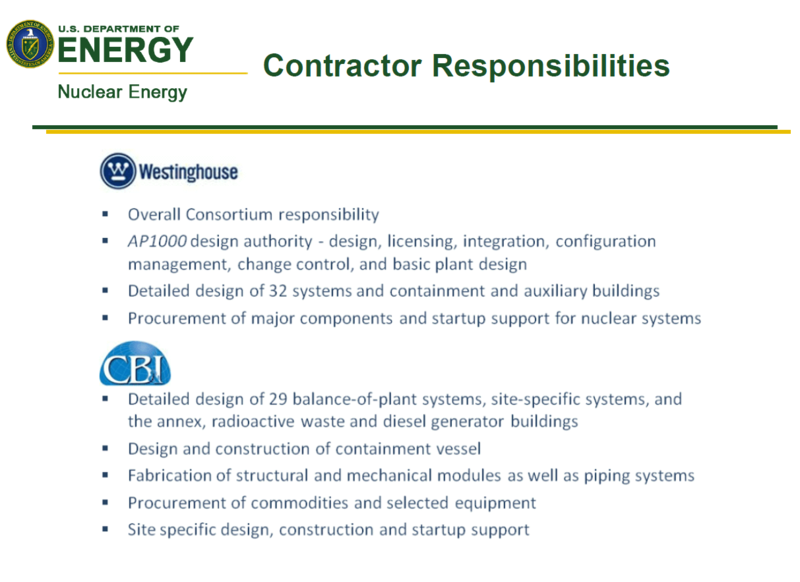 Both planned projects selected the Westinghouse AP1000 reactor design, which was pre-certified by the NRC. Since both projects elected to use the same design, both sites have most of the same components and designs — with exceptions being the concrete basemat and the cooling towers. All four reactors at V.C. Summer and Vogtle are being built by the same Consortium (Westinghouse and Chicago Bridge & Iron). The central CB&I facility is located in Lake Charles, Louisiana where the modules are fabricated before being shipped to construction sites to be assembled. 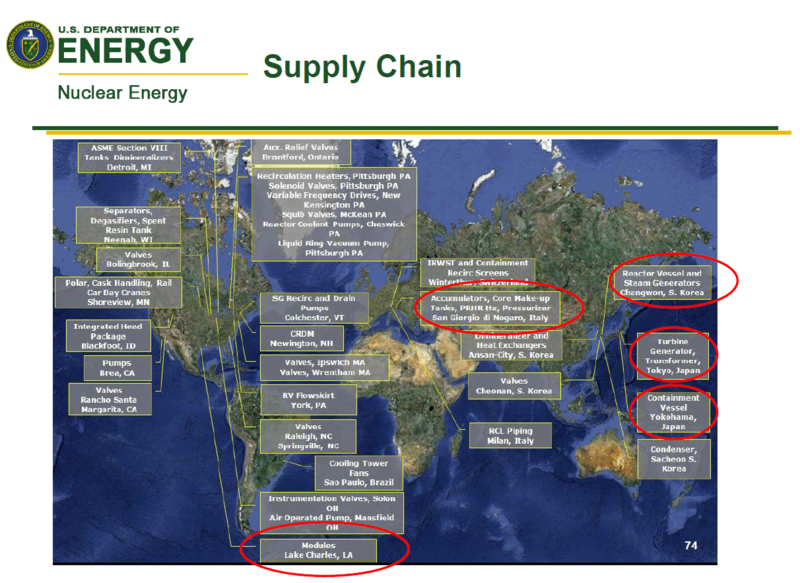 The supply chain which CB&I and Westinghouse employed connects vendors from around the world. Various tanks are supplied from vendors in Michigan and Wisconsin, cooling tower fans are obtained from Brazil, vendors from Illinois, California, Ohio, Massachusetts, North Carolina, Pennsylvania, and Canada supply assorted valves, reactor coolant pumps and recirculation heaters are supplied from Pennsylvania, containment recirculation screens are sourced from Switzerland, the reactor vessels, steam generators and heat exchangers are all supplied from South Korea, and the turbine generators and containment vessels are delivered from Japan. After streamlining the licensing process, granting billions in federal loan guarantees, and forcing ratepayers to pay rate hikes for construction work in progress, it is quite evident that it is the industry’s lack of ability to source materials and fabricate reactor modules in a timely and cost effective manner that is sinking the construction of next-generation reactors. According to South Carolina Electric & Gas (SCE&G), the Consortium (CB&I and Westinghouse) has been hampered by delays in fabrication and delivery of submodules for the V.C. Summer Units under construction and these delays are the primary reason for continued delayed completion estimates. The very components of the construction process that were streamlined are now causing the biggest delays, and the components of the regulations and licensing which were streamlined to accommodate the industry’s needs are the very tools used to transfer the risk and costs to the ratepayers and public at large, while also protecting shareholder profits. The complicating issue is that when deficiencies or problems are encountered they have a tendency to adversely affect operations at both the V.C. Summer and Vogtle construction projects. Even if the problems are limited to one project, the delays caused by those problems can still affect the construction timeline for the other project. In January 2011, November 2011, and September 2012, NRC inspectors identified issues with the effectiveness of CB&I’s corrective action program and programmatic controls. The investigation was initiated on April 20, 2011 to determine (1) if management at CB&I-LC willfully instructed welders to weld safety-related sub-modules using a Welding Procedure Specification (WPS) with incorrect settings, and (2) if welders backdated training certifications to weld procedures. CB&I continued to oppose the violation and, in lieu of continuing the enforcement process and eventually requesting a hearing on the violation, requested alternative dispute resolution. The areas of focus for the stop-work order were: 1) production, 2) corrective action, 3) procedures, and 4) training. The NRC conducted an inspection and determined that CB&I LC was not fully implementing its QA program in the areas of corrective action and control of nonconforming items. Additionally, the NRC identified several missed opportunities that should have led to an earlier initiation of the stop-work order and for an evaluation to determine the impact on previously fabricated sub-modules. In September 2014, V.C. Summer and Vogtle notified the NRC and CB&I of a significant breakdown in CB&I’s QA program. As part of the agreement reached through the alternative disputes program, CB&I had to admit that its safety culture to date had not been effective, and that it would take a number of actions to strengthen the safety culture monitoring program, the employee concerns program, employee training, and communications. In response, CB&I shifted work from the Lake Charles facility to the module assembly facility onsite, and ultimately to a different firm in South Carolina. The full extent of the schedule delay and the increased costs have not yet been fully determined. The first units at the V.C. Summer and Vogtle sites were originally scheduled to begin commercial operation in April 2016, with the second units following in April 2017. Southern Co. is also in a legal battle with its contractors over $900 million of additional costs related to construction design changes. If the project sponsors lose the legal proceedings and the construction contractors are not forced to pay the additional costs the project’s final costs would rise to $16.5 billion. The V.C. Summer nuclear power plant expansion in South Carolina is years behind schedule because the manufacturing of key components has failed to meet time deadlines, pushing the overall project completion date to 2020.